As guest performer of the Universal Trio with Rainer Glas, Willetta will sing classic songs from one of the coolest eras of Jazz, the 70's. The evening will also include well known favorites at the Kellerhaus in Pommersfelden at 7:30 pm. Those of you who won't have the chance to see Willetta at the Kellerhaus can come to the Fify Fifty in Erlangen on March 28, 2011 at 8:00 pm. 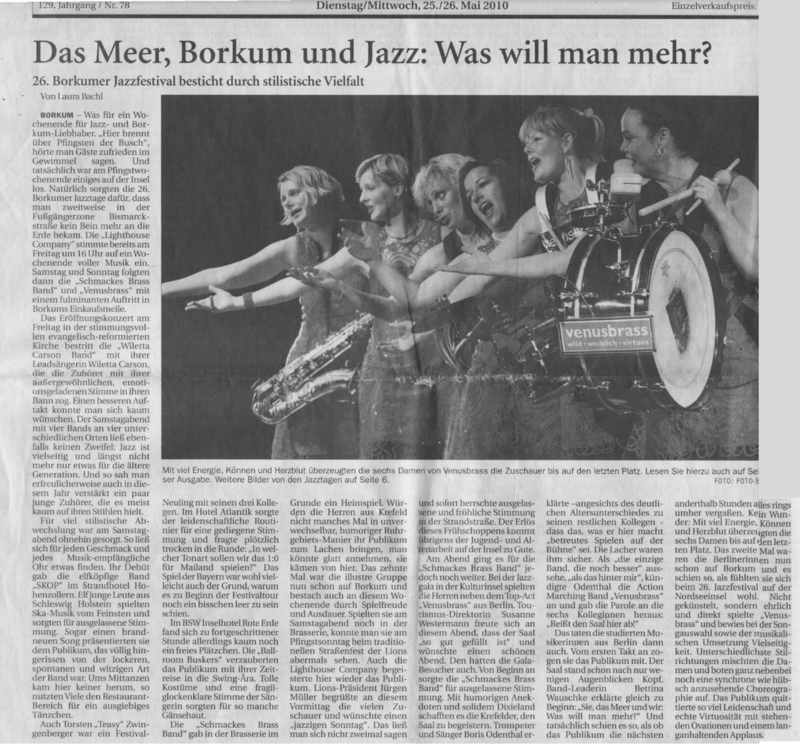 An article about the "Nacht der Stimmen" (Voices in the Night). "Nacht der Stimmen" is a benefit concert held at the Markrafen Theater in Erlangen on Friday, Nov 26, 2010. The guest will be taken on a musical journey from the world of jazz to pop musicals and operettas. You can look forward to hearing jazz singer Willetta Carson from Chicago and tenor, Georgios Bitzios accompanied by pianists Thomas Fink and Rainer Armbrust. 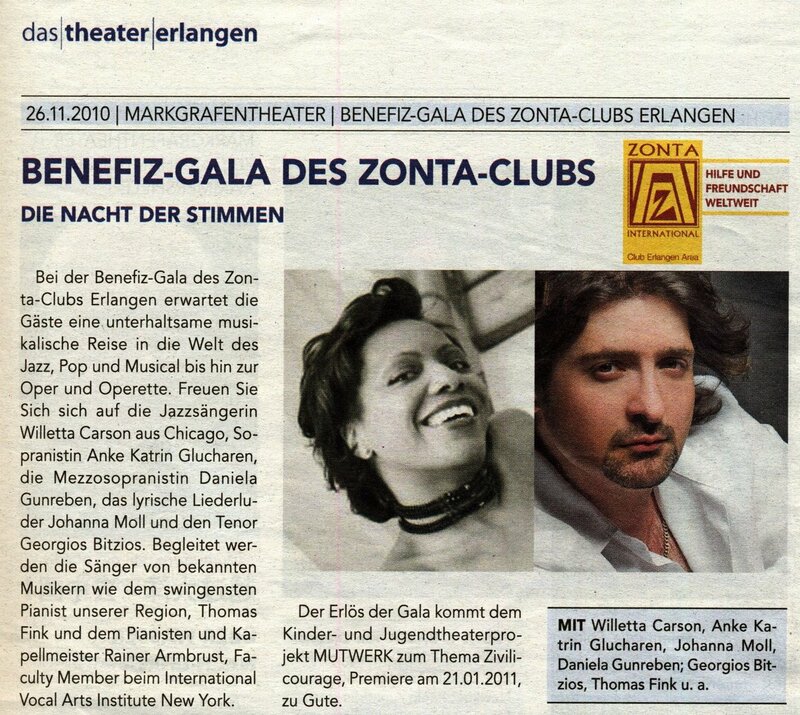 The concert is organized by the international Zonta's club and all proceeds go to the youth project "Mutwerk" (works of courage) to help fight against voilence among youth. Read about the debut of the Chicago Christmas concert in the Comödie opera house in Fürth, Germany on November 25, 2010at 7:30 pm. Willetta played with Thomas fink, Werner Treiber and Manfred Hartlieb at "Lebenshilfe childrens school" a benefit concert to support the school for mentally handicaped children in Oberasbach. Klick on the image to read an announcement by www.blauer-kurier.de. Willetta was interviewed by the Fürther Nachrichten in "Frage Würdig" (Worth asking). Willetta performed with Guitarist, Peter Pelzner at the Ceremony of the book release "Wir sind Erlangen", in which Willetta was also portrayed. "We are Erlangen" present 30 portraits of 30 people from more than 20 countries, 30 stories from one city. This book goes right to the heart of the international awareness of life in Erlangen. The authors made their contributions by conducting their researched through personal conversations with their subjects. 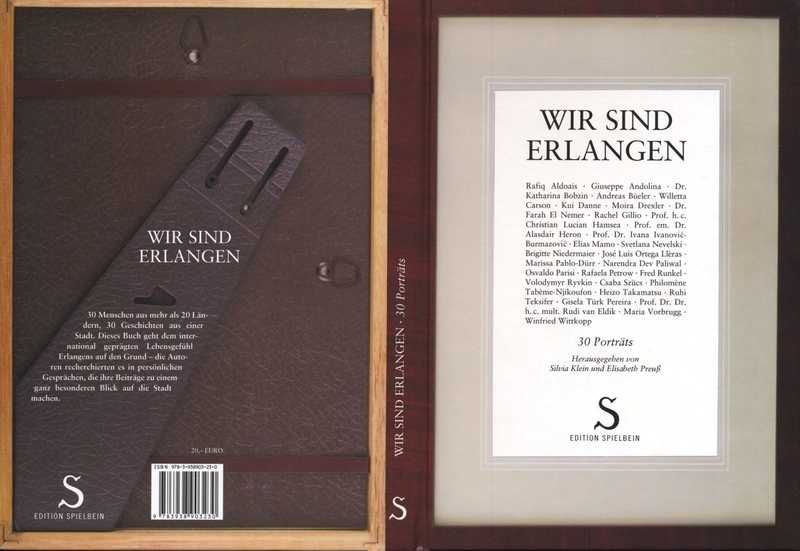 The book was issued by Mayor, Dr. Elisabeth Preuß und Silvia Klein. Klick to see book cover. Neumarkt Jazz Days in the City's Residence. 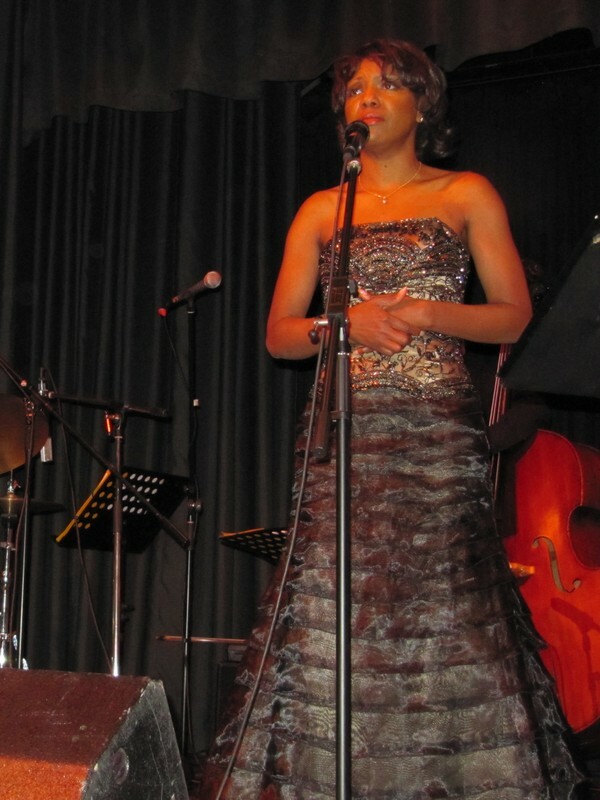 Willetta Carson performed in the newly renovated Residence castle in Neumarkt. Read articles of Neumarkter Tagblatt or Neumarkter Nachrichten. Watch Willetta's surprise performance at the Schlossgartenfest in Erlangen. View the video on the internet magazine www.marktspiegel.de at this link. 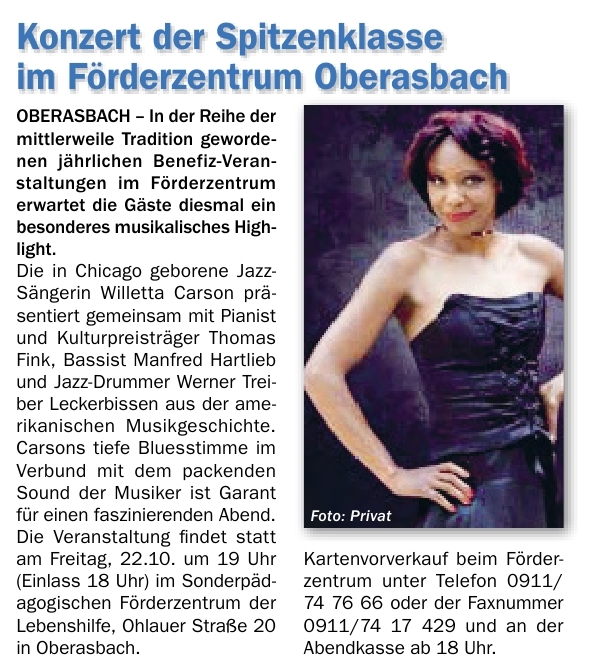 7:00 pm, Willetta Carson & band perform jazz, swing, soul, blues and gospel at the "Pfarrhof Serenade" Röttenbach. Link to articles are here and here. 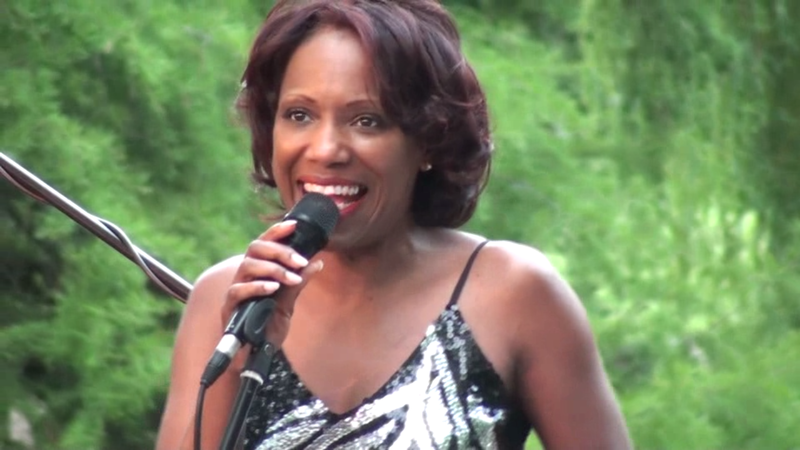 7:30 pm, on the "Freilichtbühne" in Fürth the Willetta Carson presents "Jazz im Park – Blues in the Night", a selection of blues classics in every variation from swing and latin to groove including evergreens played with new pep and new perspective. Link to 2nd image. 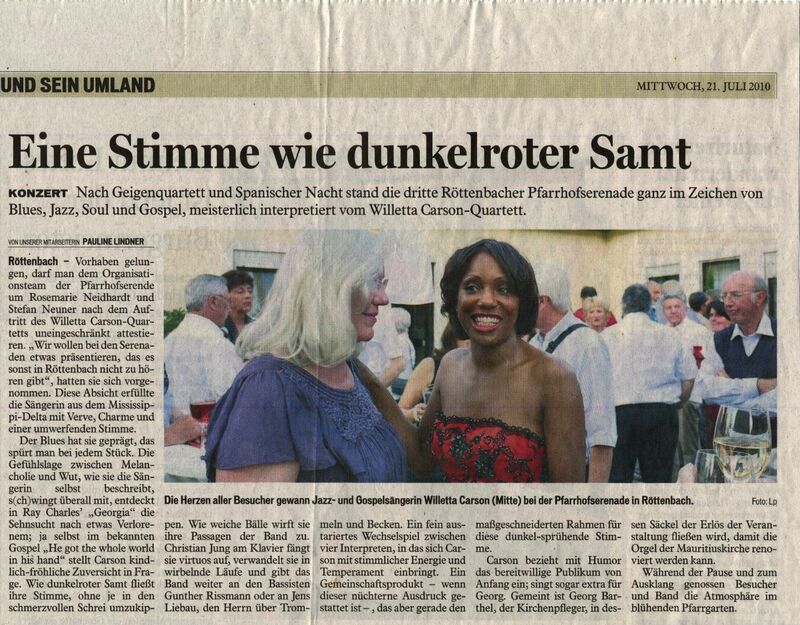 Willetta was interviewed and portrayed in the Erlangn newspaper about Vocal Affairs. Link to article. Fürth City Festival: Back by popular demand: Willetta Carson will perform accompanied by her combo at 3:00 pm on Gustavstraße in a combination of culinary and musical quality. As always many restaurants and cafes will be open. The music program, which starts at 11:00 am, features many bands and will continue into the night. 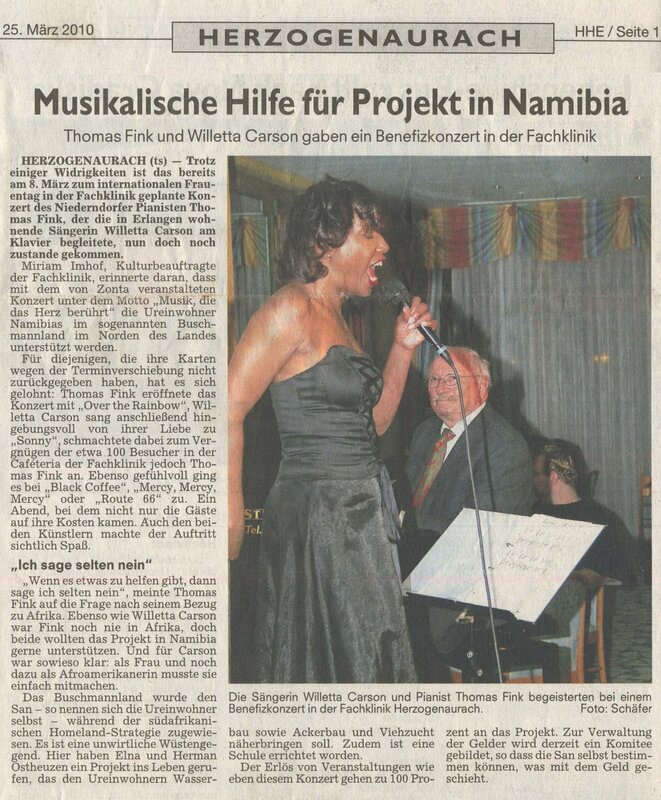 Willetta and Thomas make a Swinging duo in "Musik - die das Herz berührt" (music that moves the heart), a benefit concert in support of the Zonta Club's International Namibia Project in the Rehabilitation Clinic in Herzogenaurach. See articles here and here. 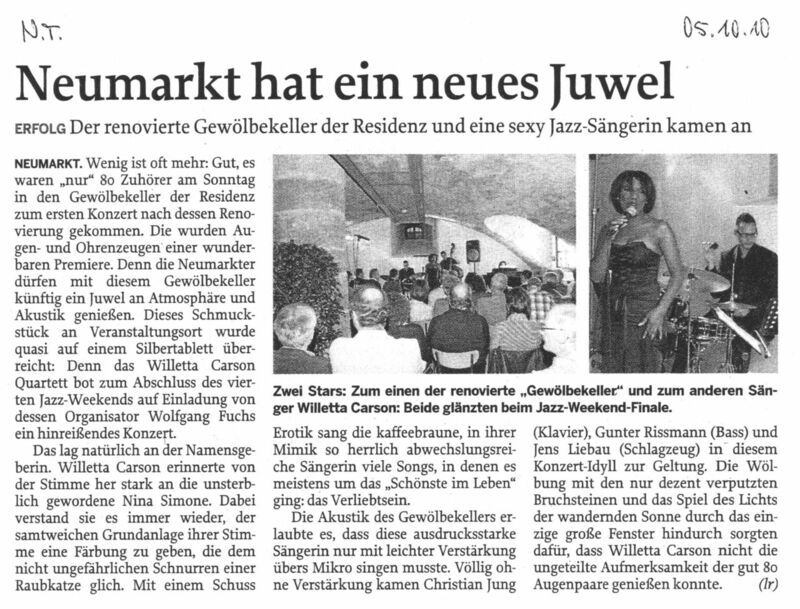 Willetta Carson had the second installation of her American Christmas series with American Christmas in the Schwarzer Adler Hotel in Uttenreuth to two sold out audiences. The pre Christmas highlights include Christmas songs played in swing, blues and bosas and with the charm of the American Christmas culture. Link to additional photo. 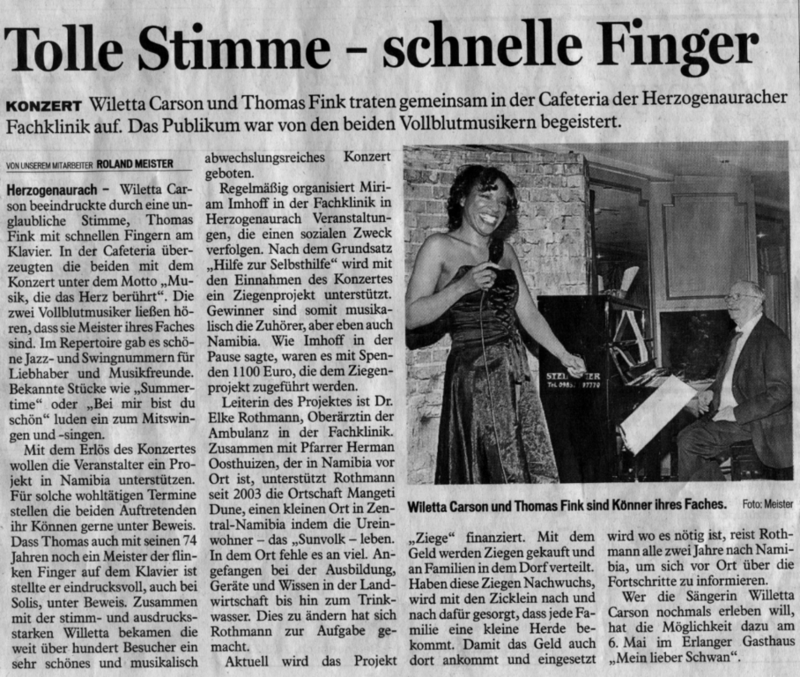 Willetta Carson will play the official opening concert of the Fürth Piano Festival with Swing, Jazz-Ballads, Blues and Latino Sound of Brasil. 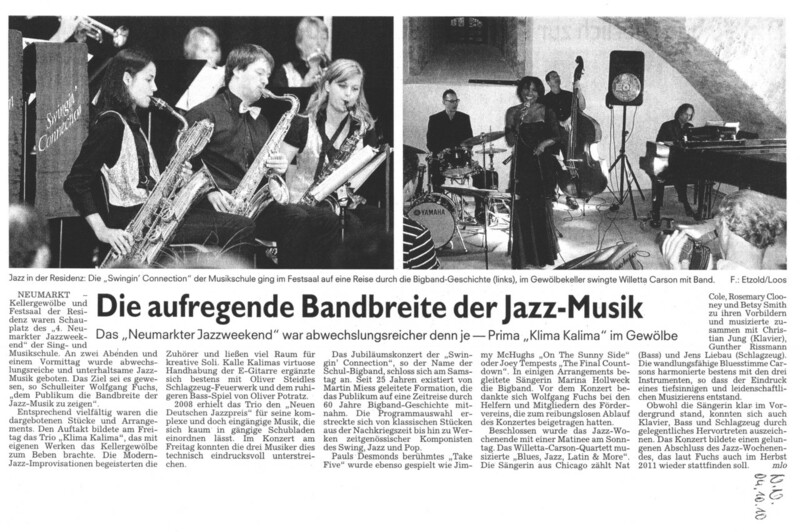 Heinzrolf M. Schmitt of HMS Consulting organized the event which features International artists and will donate most of the evenings proceeds to the St. Michaels Church of Fürth. The Fürth Piano Festival will continue until October 2009 and will take place at various locations throughout the city and end with the gala night of pianists. Trio Trikolore will perform some of the prettiest Chansons of France with Sängerin Eva Sixt as well as Michael David who is one of the best Harp players around. 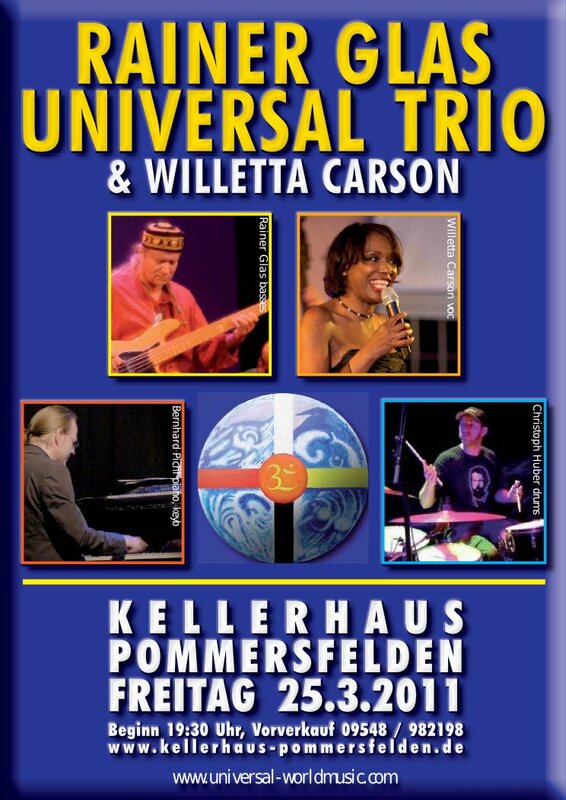 Willetta Carson & Band perform at the Freilichtbühne in city park in Fürth featuring. Marc DeVin. Fürth City Festival: Willetta Carson & Band play at the Fürth city festival on Gustavstraße..